Are you still struggling with the acne, pimple on your face and do not know how to handle them? 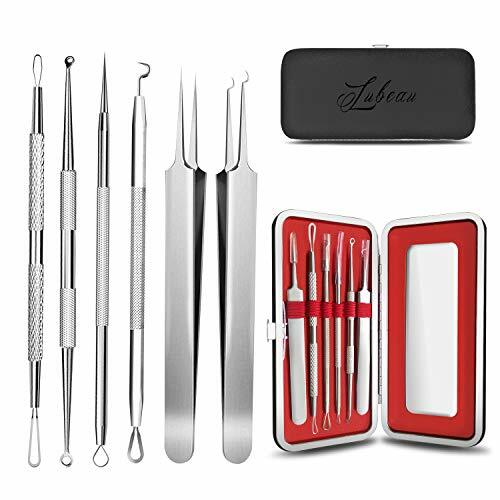 Choose this blackhead remover tool kit, 100% stainless steel antibacterial coating won’t causes skin sensitivity, safely remove pimple acne blemish whitehead popping in seconds. It can perfectly solve all your problems, you deserve to have it. Angledloop: Clean up the stubborn acne, and can reach difficult areas, such as outer ear. Small Squeeze: Located the acne and pimple. Non-slip Handle: Help you clean those slippery blackheads easily. Flat Loop: Clean up white acne on the sensitive area on your face or body. Curved Acne Needle: Punctured the acne on the chin and the side of nose. Acne Needle: Punctured the acne on the flat area easily. Straight Clip and Curved Clip: Clean up the acne and blackheads which can not be squeezed. 1. Always wash the tools in hot soapy water/alcohol and allow to air dry. 2. Confirm whether the acne is mature, if you feel stubborn and a little pain, stop continuing it, or things will be worse. 3. After using tools, your face will be red, because you pressed skin while you removing pimple and other blackhead. It will be disappeared after a short period of time, so don’t worry about it.